Duds: Those who never gave students creative writing opportunities at all. Semi-progressive: Those who used journal topics from store-bought books in the exact order listed. Progressive: Those who carefully scavenged only the best topics from the store-bought books and rejected others. Extremely creative: Those who used store-bought lists as a springboard for developing their own clever topics for journal writing. I fell somewhere between progressive and extremely creative depending on the day of the week and my state of mind. I had my routine: pick a topic from my list, date it so I wouldn’t reuse it, write it on the board, hand out the journals, and give the command to write. Then I would wait fifteen minutes, ask for volunteers to read, take up the journals, write a personal response in each one praising those who wrote and threatening/cajoling those who didn’t. It was a tidy little process that we could all accomplish in our sleep – and often did. Imagine my dismay when no one asked to see my list. When I casually draped it over my bookbag, no one even noticed. Everyone was busy doing something called “free writing” and “reflection.” After a couple of days, I began to pick up on derisive comments made about journal topics. I got huffy. “What was wrong with journal topics?” I asked. “I never could get very good responses,” said one teacher. “I wouldn’t want to have to write about anything as stupid as `My Life as a Comb’ or `You’ve Been Captured By a Band of Pirates on the Way to School Today,'” said another. I moved from huffy to indignant and replied, “If I asked you to pretend you were a watermelon seed, couldn’t you just think of gobs to write? I imagined – you’re surrounded by moist squish. Your whole world is crimson red. Suddenly there’s a blinding light and an earthquake-like crack. You’re out! But before you’ve even tasted freedom, a tongue laps you up, wallows you around, and swallows you. You pass by an esophageal hernia, through a spastic colon, and down to the nether regions. You’re searching…seeking…yearning…for a way out…” My enthusiasm peaked, then waned as I realized the group was staring at me as though I had brought new meaning to the word lunacy. “Did you ever get that kind of response from a journal topic?” one woman drawled laconically. That was the sixty-four thousand dollar question. Had I ever gotten really good writing using journal topics? A time or two but not consistently. “Of course I have. Often,” I told the woman. She just rolled her eyes and changed the subject. I am an elf named Happy. I am in a parade in Laurel. I say Merry Christmas and throw out candy. It is fun. Bye bye now. I chalked up the mediocrity to apathy or sheer laziness on the part of my students. These kids just didn’t want to write; they’d rather whine about the assignment. A story starter like “Today I Planted an Egg, and This Is What Happened” really fanned my creative flames. I truly believed that any student who made half an effort could produce a fabulous something from that premise. Not so. Some could; most couldn’t. Today I planted an egg and guess what? An egg tree came up!!! Then I planted peas and butter beans. Then I went home. I hope our team wins tonight. GO BRAVES!!!!! I checked with the other thirteen teachers at our school and discovered their experience to be similar with one notable difference. The pieces their students wrote from journal topics were considerably longer than those of my students. Granted it was still drivel, but it was lengthy drivel. “How do you get them to write so much?” I asked. All of the teachers, without exception, told me that they require students to write at least one page before they could go out to recess. I couldn’t do that. Two things I strongly believed: no one should tell a writer how long a piece had to be, and everybody’s piece certainly didn’t have to be the same length. It was a big jar of peanut butter. I like peanut butter very much. Somebody wrote in it, but I don’t know why. That’s all I have to say. Toward the end of the school year I was so frustrated that I resorted to giving no topic at all. “You may write about whatever is on your mind,” I said. Just as I thought – they had nothing on their minds. By the time the school year was over, an Alexander Pope couplet kept repeating in my brain: “Be not the first by whom the new is tried/ Nor yet the last to lay the old aside.” While I hadn’t come by my methods haphazardly and certainly wasn’t going to give them up nonchalantly, I had to admit that cutesy journal topics did not produce good writing. It was time not only to “lay the old aside” but also to try the new. The problem was how to go about it. All summer long I thought about my problem and how it could be solved. I considered the unique situation in which I teach. Our school serves a different grade of “gifted” students each day. On Monday, all of the sixth-grade gifted students from the ten elementary schools in the district travel by bus to our school for the entire day. On Tuesday, fifth graders come and so on through second grade on Friday. My classes are small, about ten or twelve, but with a total of fourteen teachers we serve about 150 students each day. So many potential writers! How could I make their potentiality reality? By the time the new school year began, I had a plan, and it included my perception of what reflective writing could be for children. I had completed the writing project too embarrassed to ask the definition of reflective writing. I was fairly certain it involved contemplation, but beyond that I wasn’t sure. Was it like metacognition—thinking about thinking? Could one only reflect on issues and actions? Maybe “one” could, but I didn’t think that was practical for my elementary students. However, I felt confident that I could teach them to reflect on a concrete object. I decided to begin by using real mirrors to teach the reflective process. I borrowed enough for each student to have one. As the students gazed at their own reflections, I asked this question: “What can you think about while looking in a mirror at your own reflection?” As they answered, I categorized each response and wrote the categories on the board. We talked at length about the various categories, and I invited the students to give personal examples of each. Then I asked them to look in the mirrors again, reflect on their images, and then write about what came to mind. When I see myself in the mirror, I think about many things. I look in the mirror and think about bad things that might happen. Sometimes I look in the mirror and think about my future, like where I want to live. I even think about what I want to be when I grow up. My younger sister Mandolin tells me I will never do the things I want to do. My older sister Zandra tells me that things will work out if I have confidence in myself. I believe my older sister. Another day I asked the students to choose anything from my desk for me to use to model reflective thinking. I asked them specifically to select something very ordinary that they thought would be difficult for me to reflect on. My fifth grade group picked a stapler. As I reflected aloud, I asked them to categorize my reflections. One student challenged me to imagine something about the stapler. “There’s no way to pretend about a staple,” she said. For the next three or four times I met with each grade, we continued to practice reflecting aloud on a number of very simple objects in the room until I felt like the students understood the technique. Finally one day I held up a toothbrush, and we brainstormed writing ideas. After the discussion I asked them to write a reflection about the toothbrush. I wrote while they wrote, and I was amazed when the time came to read aloud. Almost every student was able to write something significant. The responses were meaty and varied. From second grade to sixth grade, students had something remarkable to write about that toothbrush. There were great remembrances about lost teeth and braces, opinions about which toothbrushes are best and why, comparisons of people teeth and animal teeth, and wild tales about wicked dentists. Over time productivity ceased to be a problem. Journaling was no longer the hair-pulling ordeal it had once been, and reflection became a buzzword for us. Slowly the students and I were able to move away from simply trying to grind out some writing and move on to other parts of the writing process such as making interesting word choices. As the year progressed, we made a giant leap toward reflecting on famous artwork, classical music, and fine literature. I was always careful to make selections that I believed had meaning for my students. I got an idea when I looked at a painting called “The Piano Lesson” by Romare Bearden. I imagined I was walking down a sidewalk, and I heard an angry sound. It was coming from the instrument store. I went inside. There was a woman trying out the instruments. She was playing the piano. I said to the piano player, “That was very good. Will you play it again?” A second-grader, Edwin, responded differently! The music sounded like elephants stomping their huge feet on the ground because they were mad that a leopard came and got their baby. Devouring his first meal since yesterweek. I imagine Pieter the Elder’s painting “Peasant Dancers” shows poor country people dancing at dawn to celebrate the king’s birthday. They are happy. I know because their lips are not in a straight line. Their lips look like a “u” with their smiles so big and wide showing their white teeth. I imagine that later that day the king dies, and his son becomes king. Three months later a secret agent is in town, and he hears a servant telling a friend how he poisoned the king. The secret agent tells the new king, and new King James hangs the servant and his friend. No servant ever tries to poison the king again. All the people live happily in my imagination. When I hear Longfellow’s “Arrow and Song,” I think about my fort in the woods covered with trees. The sun shines through them like a river of light going in so many different directions I can’t keep track of it. Before I know it, I am standing in that river of sunlight and millions of thoughts run through my mind like cars on a busy highway. I sit and for once enjoy nature’s sweet sounds. I am listening to “The Gypsy Baron” by Johann Strauss. The music is pretty and exciting. Part of it sounds slow, and part is fast. It makes me feel good and happy like the time. I went to Pep’s Point. When I went to Pep’s Point, I got a mat. We had to wait in line for our turn. When it was our turn, Mom and my brother and me put our mats together and went down. Around the curves we slipped up and then back down. The mat felt wet, and it went zoom like wheels on a skate board. I was going so fast, and I was so full of excitement that I felt like it was my birthday. Looking back, I think there are several reasons why this strategy worked so well. First of all, when the students wrote, I wrote using the same reflection item they used. This was a new experience for me. Initially I didn’t write with students because I was a new teacher and didn’t have time to use the bathroom, much less write with my students. Over the years I read their miserable little responses, and I simply didn’t want to show them up and make them feel bad about their feeble efforts. 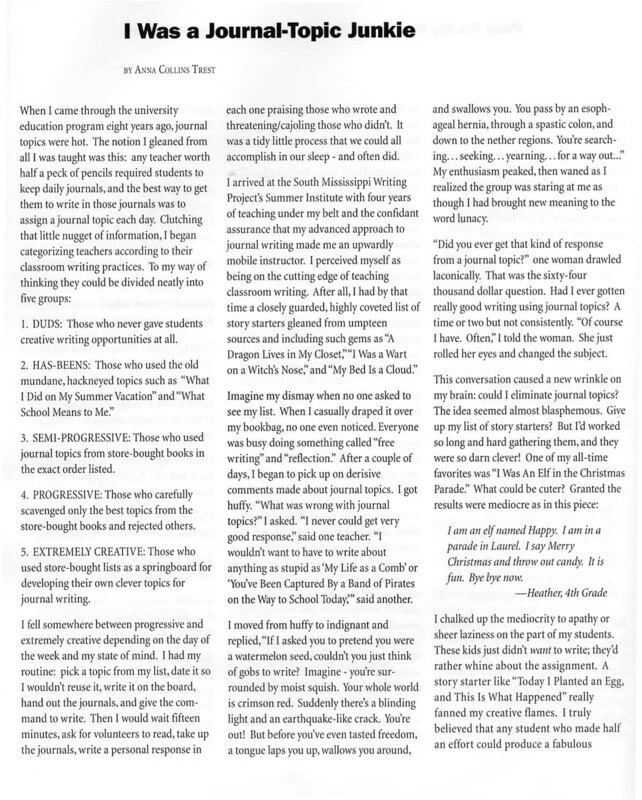 Writing with my students made a tremendous difference in their perception of journal writing. They began to believe that it must be important—the teacher did it. Now when we shared our writing, they asked me to read out loud what I had written. They especially liked the times when I would tell them, “I wrote garbage today. I just couldn’t think of anything creative.” Through that little confession, they came to see that all writers have days when they cannot produce something wonderful. Secondly, we succeeded because we spent so much time discussing before we wrote. In the past I have been guilty of severely limiting pre-writing conversation because I thought too much talk would give away too many ideas. Now I see that’s the point—to make available plenty of ideas, to crank the creative motor, and to be certain there is something familiar about the road the students will travel. I think the discussions and subsequent writings convinced many of a Trest Truism: if you can say it with your mouth, you can write it with a pencil. Extended, meaningful conversation also resulted in one other unexpected dividend. Students began asking if they had to write about the discussion topic or if they could write about something else that came to mind while we were talking. I was pleased to acquiesce. A leaf is a remarkable thing. It helps ants when there is a flood. They can get under it like an umbrella so they won’t get washed away. A leaf helps caterpillars stay alive because the caterpillar can eat a healthy leaf lunch. A leaf is also like a big cup for a wasp. He gulps down the water…glug, glug, glug.